Happy fall! Amanda here today with a fun craft to make for your kiddos. 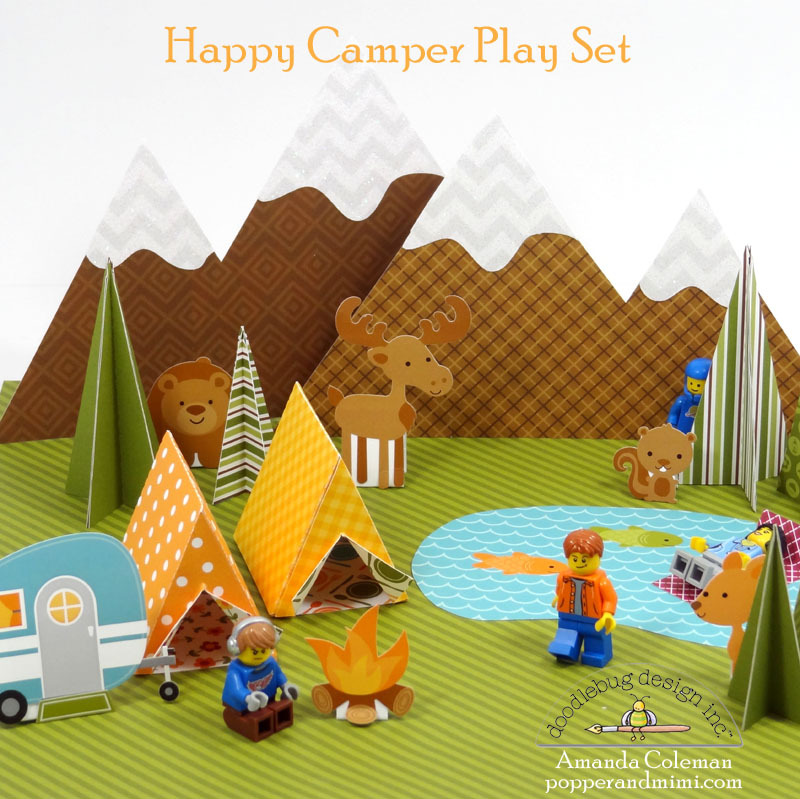 Inspired by the detailed scenes in the Happy Camper collection, I created a camping play set that will keep your kids entertained for hours! My kids, ages 8 and 10, girl and boy, are crazy for LEGOs. 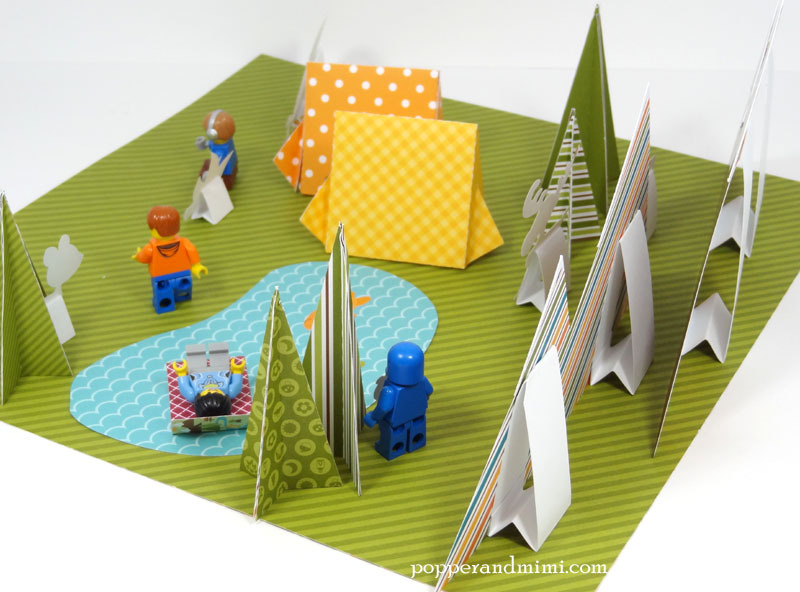 They are always coming up with some new way to create with their LEGOs so I made a little play set for them to take on their LEGO camping adventures. 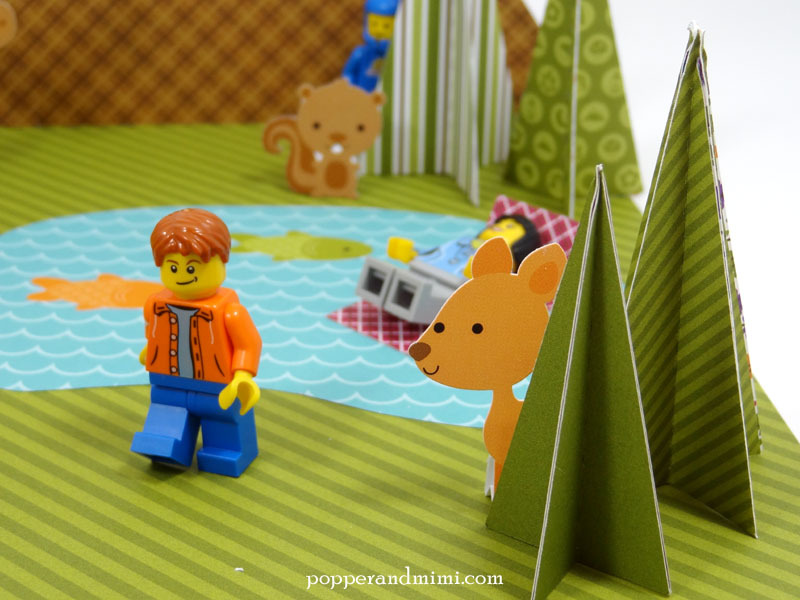 All of the pieces are moveable allowing the kids to rearrange the scene as they play. 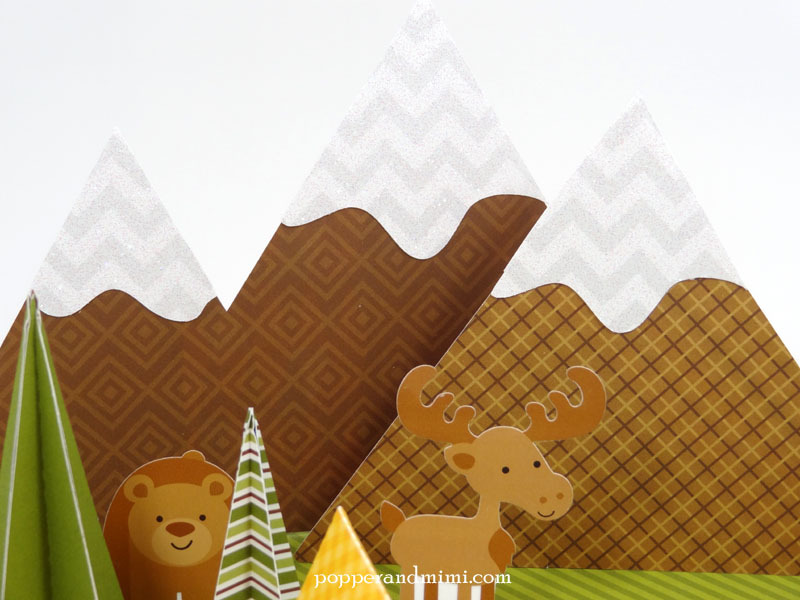 As I was looking over the Happy Camper collection (again), I remembered this little tent cut file I found a while back. This little tent is what got the whole idea of a play set rolling as I knew they would be perfect for LEGOs. A little deer takes cover between the trees. To make the trees, I folded four triangles down the center and adhered the pieces together. Happy bear. Happy moose. And glitter topped mountains. So Doodlebuggy. I lengthened the tent opening on the tent cut file just a bit so the LEGO minifigs could take a nap. All of the pieces are unattached to the base and can be moved around during creative play. 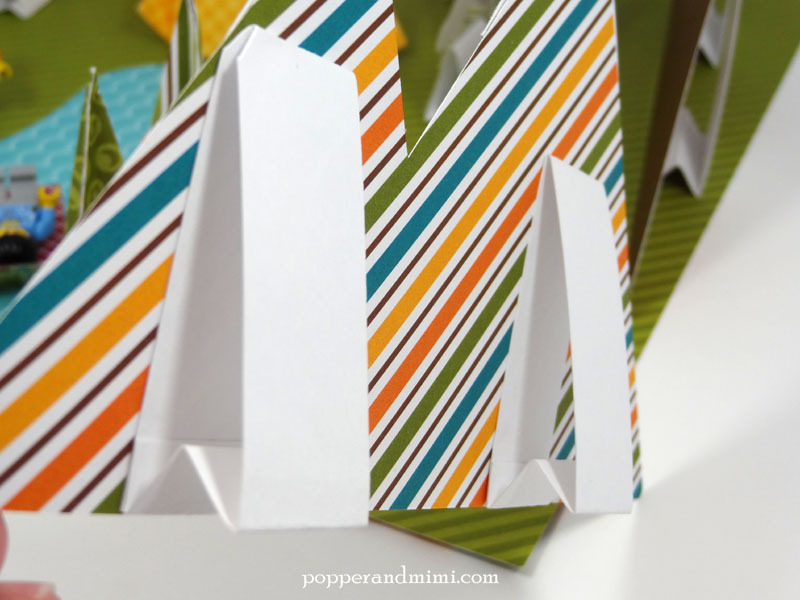 The free-standing paper pieces and stickers are propped up with little paper supports. I folded strips of scrap cardstock to fit the pieces and adhered them to the back. And just in case you didn't see it already, look at that little camper! If I had a camper in real life I would want it to look just like that. Oh my gosh, my son is going to love this! Very ingenious idea!! love everything, is very inspiring!!! Pinned to my "Lego Ideas" board and to my "paper craft projects" boards on Pinterest! LOVE this, sharing on FB (once today's is posted). REALLY LOVE the inspiration. forgot I could share from your page, so shared it on FB also. This is just so cute I can't stand it!!! So clever Amanda!!! This is just too much fun! I love it!!! How adorable and outside-the-box! Those tents are the cutest! This is so awesome! Shared on Facebook! Seriously soo amazing!!! Im impressed! I've tried to make paper game things for my kids but this is a whole new level! Wow, what a creative idea!! My kids love Legos and I can't wait to make this! Thanks for the inspiration. This is so clever and fun! Great idea!!! WOW - this is AMAZING & AWESOME Amanda!!! 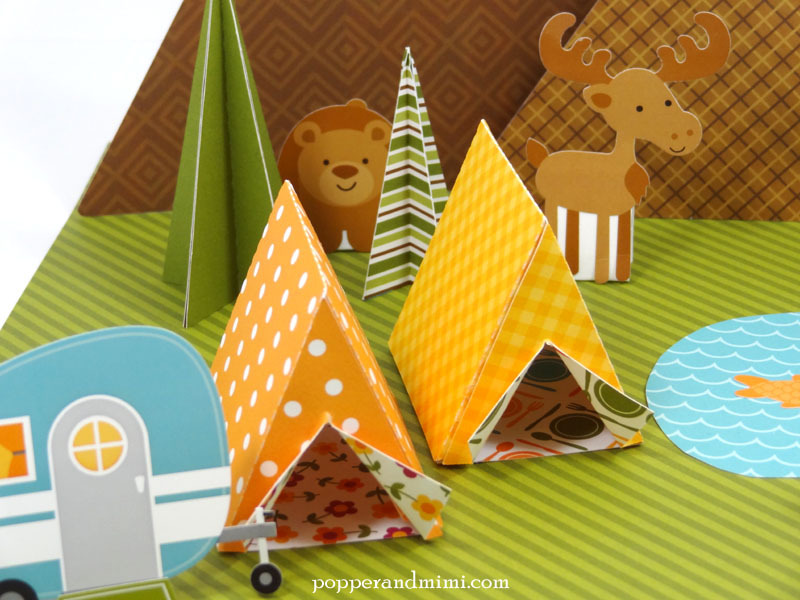 LOVE the CUTE camper, tents & trees!!! Pinned http://www.pinterest.com/pin/312578030361604672/ Such a fun way to mix craft and play! The little deer is so cute! 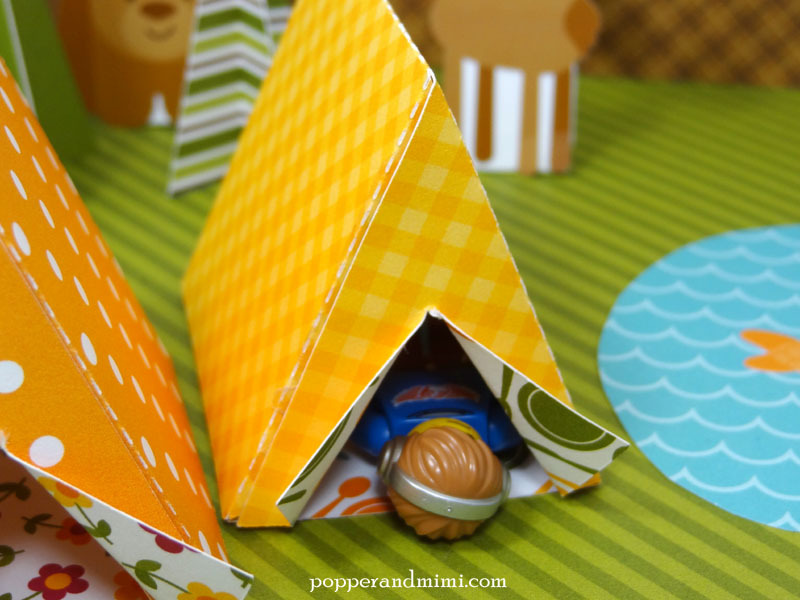 I love the little tents made with the double sided cardstock. The polka dot tent with the flowery inside is so cute! Wow Amanda!!! This is just fantastic!!!!! 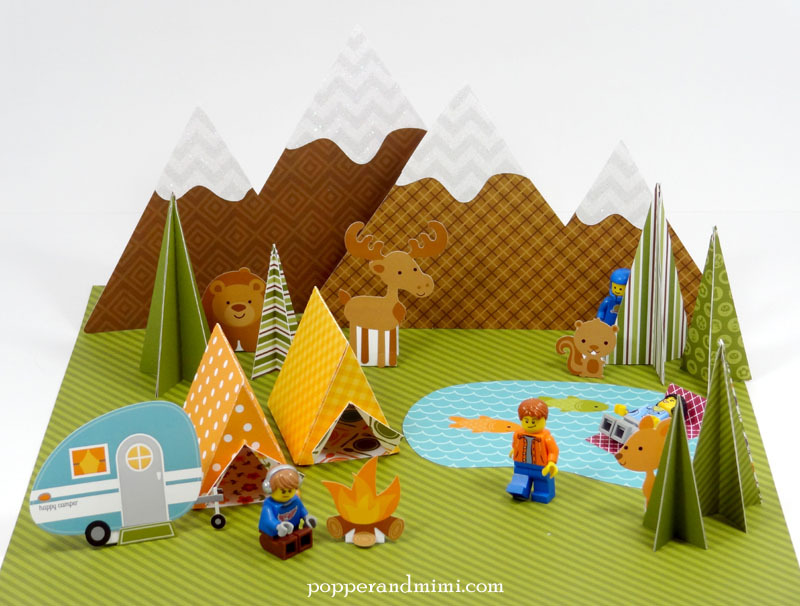 I pinned the SUPER CUTE doodle-pops pack that Amanda used - LOVE the camper and would LOVE to have one just like it!!! Amanda Rocks - I shared about this on facebook!! !